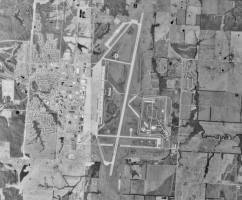 A brief history of Whiteman AFB, Mo. Whiteman Air Force Base is located in Johnson County, Missouri, 65 miles southeast of Kansas City. The base is two miles south of Knob Noster, just off U.S. Highway 50. Whiteman is about 10 miles east of Warrensburg and 20 miles west of Sedalia. The base had it beginnings in 1942 during the U.S.' mobilization following the Japanese attack on Pearl Harbor. It was originally activated on Aug. 6, 1942, as Sedalia Glider Base. In August 1951, however, the base returned to life again and became a part of Strategic Air Command. SAC activated the 4224th Air Base Squadron to supervise the rehabilitation and construction of a new base, Sedalia AFB. The 4224th continued its activities until Oct. 20, 1952, when it inactivated while turning over the base to the 340th Bombardment Wing. SAC scheduled the 340th to received the command's newest aircraft systems, the B-47 Stratojet and KC-97 tanker. Construction workers soon completed runway repairs and other projects in November 1953, paving the way for the arrival of the first B-47 in March 1954. On June 14, 1961, the US Government announced that Whiteman would serve as a support base for the fourth Minuteman strategic missile wing. After the announcement, there were second thoughts about the choice as original plans called for launchers to be spread into the Lake of the Ozarks region. Due to the terrain inaccessibility and the high water table, these plans were scrapped. Consequently, when the final approval came on January 17, 1962, the launchers were placed in the vicinity of Whiteman, making this the smallest Minuteman base with regard to area. In February 1962, the Los Angeles-based Corps of Engineers Ballistic Missile Construction Office established a resident office at Whiteman. Meanwhile, the Real Estate Division of the Corps of Engineers Kansas City District set up an office in Sedalia to acquire the needed land. The the firm of Morrison, Hardeman, Perrini, and Level submitted a low bid of $60.6 million and was awarded the contract on March 20, 1962. Although construction commenced on April 2, official groundbreaking ceremonies occurred on April 14, 1962, with several congressmen and Governor John Dalton joining military officials at the event. The contractors used 168,000 yards of concrete, 25,355 tons of reinforcing steel and 15,120 tons of structural steel for construction of hardened, underground launch facilities and 15 launch control centers. The project called for the excavation of 867,000 cubic yards of earth and rock. In addition, the project called for the installation of a vast underground intersite cable network. If laid end to end in a straight line, this cable would stretch from Whiteman AFB to 100 miles beyond Los Angeles. Construction of the complex was officially completed in June 1964. The enormity of the ensuing construction effort encompassed not only installing 150 silos and 15 launch control complexes but also constructing/reconstructing numerous roads and bridges throughout rural western Missouri. The 'Hardened Intersite Cable System," measuring some 1,777 miles, connected the launch control centers and required land rights-of-entry from more than 6,000 landowners. During construction, management-labor relations were described as "excellent." With the exception of ironworkers, the local region supplied the project's manpower needs. There were five work stoppages, of which three involved union jurisdiction disputes. The Federal Mediation and Conciliation Service resolved one dispute while the others were handled at lower levels. In addition, there were only 11 "time-lost" injuries; no fatalities. On June 10, 1963, the Army Corps of Engineers and civilian construction contractors turned the first flight of silos over to the Air Force Site Activation Task Force (SATAF). Over the next 5 months SATAF received responsibility for making final installations on the rest of the silos in preparation for final turnover to SAC. The keys to the final flight of silos were turned over to SATAN and the integration contractor (Boeing) on November 26, 1963. The first Minuteman I missile arrived from the Boeing plant at Hill AFB, Utah, on January 14, 1964. Soon the holes dotting the Missouri landscape were filled with ICBMs. By June 29, 1964, the last flight of missiles went on alert status, making the 351st a fully operational strategic missile wing. Beginning on May 7, 1966, and throughout the rest of 1966 and into 1967, the Air Force replaced the Minuteman I "B's" with Minuteman 11s. The completed transition in October 1967 gave the 351st SMW the distinction of being the first wing to complete the Force Modernization Program. One of the retired Minuteman Is eventually found its way to a Bicentennial Peace Park located on base. Before completion of the construction, SAC activated the 351st Strategic Missile Wing at Whiteman on Feb. 1, 1963. The 340th BMW gradually phased out operations during the same year with its remnants transferring to Bergstrom AFB, Texas, on Sept. 1, 1963. After the mission change in 1963, life on Whiteman remained relatively stable throughout the 1960s and 1970s. Still, there were programs to continually update and improve the base's weapons systems. Whiteman initially employed the Minuteman I weapons system until the mid-1960s when a force modernization program converted the Minuteman I to the Minuteman II. In the late 1980s, the 351st fielded the first female Minuteman missile crew, the first male and female Minuteman crew, and the first squadron commander to pull alert in the Minuteman system. Under the provisions of the Strategic Arms Reduction Treaty, the Minuteman II system is being inactivated. Then came an announcement that would change Whiteman forever. On Jan. 5, 1987, Congressman Ike Skelton revealed that the first deployment of the B-2 Advanced Technology Bomber would be at Whiteman. Beginning in 1988, a massive construction wave that created new buildings designed for B-2 operations, maintenance and support activities swept over the base. On Sept. 30, 1990, the 509th Bomb Wing moved its headquarters to Whiteman albeit in an unmanned and non-operational state. During the next three years, Whiteman's building infrastructure continued to grow as the arrival date of the first B-2 drew nearer. On April 1, 1993, the 509th returned to operational status when people from Detachment 509, the base's B-2 overseers for the past two years, were formally assigned to the wing. Then, on July 1, 1993, the 509th accepted the host responsibilities for Whiteman from the 351st and a new era dawned for the base. Several days later, on July 20, 1993, flying operations returned to the base after a 30-year hiatus when the first permanently assigned T-38 landed at Whiteman. Then, on Dec. 17, 1993, the event that Whiteman had long awaited finally arrived. On that day, at approximately 2 p.m., a dark jet bomber swooped from the sky and landed on the Whiteman runway. Amid much fanfare, the first operational B-2, The Spirit of Missouri, had arrived. Less than a week later, on Dec. 22, 1993, Whiteman again made history as it generated the first B-2 sortie from the base. In 1995 the base also lost one of its long-time resident units. On July 31, 1995, the 351st Missile Wing officially inactivated, ending its 33-year association with Whiteman AFB. In late 2000 ground was broken for the new $25-million B-2 low observable restoration facility. The new facility will have two bays to accommodate one B-2 in each bay for restoration of its stealth skin. In addition, the facility will provide spaces for storage, training, administration, a small paint booth, and support shops. The LO facility, which will be located at the north end of the flight line, will provide the wing with more flexibility in maintaining this low-density, high-demand asset. Maintainers will be able to house two B-2's simultaneously. The LO restoration basic process involves towing a B-2 into position in the facility where as many as 15 LO personnel prepare the surface by stripping and sanding it, then applying repair materials. The repaired areas are then completely cleaned before painting. Significant environmental controls are being implemented to allow for complete ventilation and filtering of the air, mitigating the exposure to paints and sanding byproducts. The 53,000-square-foot facility is scheduled to be complete in November 2002. Until then the aircraft must go to Northrop's plant at Palmdale, California for this extensive skin restoration. In its 2005 BRAC Recommendations, DoD recommended to realign NAS New Orleans ARS, LA. It would distribute the 926th Fighter Wing's A-10 aircraft to the 442d Fighter Wing (AFR), Whiteman Air Force Base, MO (nine aircraft), and the 917th Wing (AFR) at Barksdale Air Force Base, LA (six aircraft). The 442 wing HQ element also would realign to Nellis Air Force Base, NV, and the wing Expeditionary Combat Support would realign to Buckley Air Force Base, CO. Both Whiteman (28) and Barksdale (33) bases had a higher military value for the A-10 operational mission than New Orleans (49). These realignments would bring the units at Whiteman and Barksdale to optimal size.